Home > Signs & Signage > General Signs > Public Area Signs > 3 sign. Disabled ramp symbol, arrow left sign. 3 sign. Part of our tactile and braille sign range. Available in two colour combinations. Disability Discrimination Act (DDA) compliant. High colour contrast, moulded plastic material with adhesive backing. 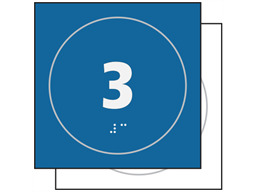 Tactile and braille general facility signs. 3. High colour contrast for visually impared. Moulded plastic sign compliant with Disability Discrimination Act (DDA), incorporating tactile surface and braille script. V2102B Size 150mm x 150mm. Material moulded rigid plastic, adhesive backed. Colour combination white on blue background. V2102W Size 150mm x 150mm. Material moulded rigid plastic, adhesive backed. Colour combination black on white background.